Gold fourth, fifth, and sixth wound strings are made of 80/20 bronze plated copper wrapped around a nylon floss core providing a smooth, rich tone. All Ernie Ball strings are precision manufactured to the highest standards and most exacting specs to assure consistency, optimum performance, and long life. Silver fourth, fifth, and sixth wound strings are made of silver plated copper wrapped around a nylon floss core providing a smooth, rich tone. All Ernie Ball strings are precision manufactured to the highest standards and most exacting specs to assure consistency, optimum performance, and long life. 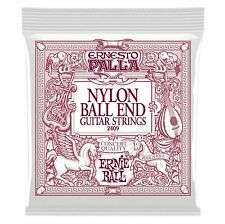 Ernie Ball Black Ukulele strings P02326,Ball End, Legendary!! Ernie Ball Ukulele strings feature ball end construction for easy installation and enhanced tuning stability. Ernie Ball Black Ukulele strings. Available in both black and clear nylon sets. Ernie Ball 2409 Ernesto Palla. All Ernie Ball strings are precision manufactured to the highest standards and most exacting specs to assure consistency, optimum performance, and long life. Classical Ball End String Set. Ernie ball 2406 CANTINI NERI. 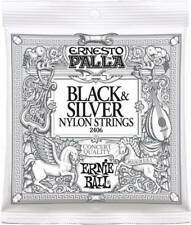 Silver fourth, fifth, and sixth wound strings are made of silver plated copper wrapped around a nylon floss core providing a smooth, rich tone. All Ernie Ball strings are precision manufactured to the highest standards and most exacting specs to assure consistency, optimum performance, and long life.